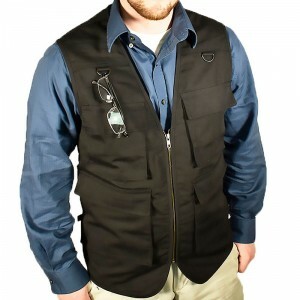 The Outback Reactor Concealment Vest has a durable design with the consumer in mind. Our vest is tightly stitched and has a heavier weight than our competition to ensure it is long-lasting through the toughest situations. Of the 14 extra deep pockets, 4 are Velcro, 2 have YKK zippers, 2 have clasps, and 6 have elastic to meet whatever your storage needs may be; 4 of the pockets measure over 8 inches deep. 2 D-rings are attached to the front, which conveniently hold fishing lures, glasses, pens, and other accessories. Backed by our 1 year manufacturer warranty for craftsmanship. "As the senior merchandise buyer for the National Rifle Association's online store and catalog (NRAstore™), I am writing to you on behalf of BlueStone Safety Products. We've been working with and buying from Bluestone for nearly seven years. Together, we've built many quality products for the civilian and law enforcement market. I would strongly recommend Bluestone Safety Products as a valued and dedicated supplier...Their innovative, American-made designs resonate with the firearms community, and this is evidenced by their dedicated following with NRA members." "I just had my first vest made at BlueStone and I am extremely impressed with it! The quality of vest is excellent, it was custom made to fit and it fits PERFECTLY! The customer service was wonderful, everyone here is extremely welcoming and willing to help with what ever your needs are. I will absolutely recommend them in the future!" "I would like to extend my sincere appreciation to BlueStone Safety Products for your service with custom fitted Bulletproof vests and vest covers to our department since 2008. I would like to share with you that my officers have worn your body armor and are happy with the custom fitting for concealment of secondary/ back-up equipment meeting our department's uniform specifications for Vest Covers and Body Armor. You have also made our expereince with your support in documentation for the Bulletproof vest partnership Grant application easy for Northeastern Illinois University Police Department. We are looking forward to future experiences and appreciate the efforts of BlueStone Safety Products for Northeastern Illinois University Police Department." "I have been a police officer in Gary, Indiana for 12 years. Bluestone Safety formally know as Nate's, has supplied me with highest quality outer vest carries for my career. The first outer vest carrier lasted in the outdoor work environment for 5 years before it needed to be replaced. They promised me that the vest would be completed in a few days. I received a call the next day advising me that they were finished with my order. That was one day faster than they predicted. The vest fits great along with all of my equipment inside. Overall, I am very satisfied with Bluestone Safety. I recommend Bluestone Safety to all Law Enforcement Agencies."